The Prime Minister spoke with Trud correspondent Petyo Blyskov ahead of his visit to Bulgaria. Petyo Blyskov: Mr Medvedev, you are going to Bulgaria on March 4, a day after our country celebrates the 141st anniversary of its liberation from the Ottoman yoke. Last year’s visit by Patriarch Kirill was also timed to coincide with this date. He pointed out “in a sharp tone” that it was Russia that liberated Bulgaria. It created an impression that Sofia had offended Moscow. Is there tension between Russia and Bulgaria regarding the interpretation of historical events? 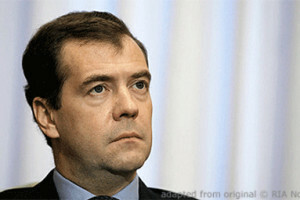 Dmitry Medvedev: In this case there is nothing and no one to feel offended at. Whereas there are very many wonderful moments in our common history. We will always remember them. March 3 is a remarkable date. We honour the heroes – Russian soldiers and Bulgarian volunteers – on this day. They fought together for the independence of the Bulgarian people. The memory of that victory is cherished both in Russia and in Bulgaria. We have a shared history, shared memory, and shared gratitude for the heroes of the war of liberation. Grievances or tension are simply not possible. Dmitry Medvedev: And that is a good sign. It is crucial that society preserves an animated interest in the history of Bulgaria’s liberation in the 1877-1878 Russo-Turkish War. The views in Moscow and Sofia generally overlap. Petyo Blyskov: Bulgarian and Russian officials always stress the close relationship between our countries during their visits. But are we really that close? Do you think our economic relations are stagnating? Dmitry Medvedev: We are going through a fairly complicated period in relations between Russia and the European Union of which Bulgaria is a member. The economic sanctions and political pressure on Russia exerted by the EU, instigated by the US, represent the worst possible way to deal with other nations. It has not done anyone any good. But it is important that even under such complicated conditions Russian-Bulgarian economic ties keep progressing, albeit not at full capacity. Last year bilateral trade reached about $3.5 billion. Which means it remained almost unchanged even though it managed to grow by 24 percent in 2017. Meanwhile, our trade with the EU as a whole has been growing at a decent pace for the second year in a row. We need to be more active and together seek opportunities for cooperation. We are doing that. The Russian-Bulgarian Intergovernmental Commission on Trade, Economic, Scientific and Technological Cooperation resumed operation last year after a three year interruption. Its objective is to integrate and expand on our capabilities in the most diverse areas. Petyo Blyskov: Which of them do you think are the most promising? Dmitry Medvedev: We have been cooperating in energy for almost half a century. Much depends now on such large-scale projects as the Belene nuclear power plant, and the second line of the TurkStream gas pipeline. Also, there are a number of goods that fall outside the sanctions and counter-sanctions, so nothing stands in the way of trade there. There is good potential in tourism and transport. We are ready to support cooperation among our countries’ small and medium-sized businesses, as well as some regions and cities. And, of course, joint projects in education, science, culture and the arts. People always show special interest in this both in Russia and Bulgaria. Petyo Blyskov: Could you please go into more detail on TurkStream? When will the final decision be taken on its possible extension across Bulgaria? Dmitry Medvedev: The option of extending the second line of TurkStream to Bulgaria, Serbia and Hungary is currently being worked out. We are confident that cooperation on natural gas meets the interests of our economies – not only the Russian and Bulgarian economies, but the overall European economy, too. But the final decision does not rest with us alone. Which extension option for TurkStream is ultimately chosen will largely depend on the availability of gas transport infrastructure. That, in turn, depends on the involvement and concrete actions of the governments in the respective countries. Petyo Blyskov: Bulgaria has expressed its interest clearly enough, right? Dmitry Medvedev: Yes, we are already seeing progress in Bulgaria. Bulgartransgaz has recently completed the open season procedure – the collection of binding bids to reserve future gas transmission capacities. Also, Bulgartransgaz has made the final investment decision on the project to develop and expand its gas transmission system. The road to beginning construction work is all clear. However, a large and expensive project like a gas pipeline requires additional guarantees. The new line should not suffer the fate of South Stream. So the decision to extend the TurkStream pipeline across Bulgaria depends on whether Sofia can get firm guarantees that the EU will not obstruct the plans for gas supplies via the new gas pipeline. We are confident that the construction of another gas corridor will further enhance energy security in Europe. With the current policy of liberalising the gas market, it will be possible to use the existing infrastructure more flexibly depending on obligations, market conditions, transportation costs and other market factors. Petyo Blyskov: The Venezuelan crisis has once again highlighted the global confrontation between Russia and the United States. What interests is Moscow protecting in Caracas? Dmitry Medvdev: Let’s first define the terms. The tension around Venezuela is not about global confrontation between Russia and the United States. And, in fact, that global confrontation is long gone, even with all the current difficulties in our relations with the United States. These Cold War clichés are deceptive. They just divert attention from the essence of what is happening in Venezuela and, naturally, from the role being played in these events by the US and a number of countries in Europe and South America following in its wake. The information clamor around Venezuela is intended to veil the conflict between international law and the rule of law, on the one hand, and total lawlessness, on the other. Washington’s efforts have led the discussion of the socioeconomic situation, the legitimacy or illegitimacy of the presidential election in Venezuela, away from constructive dialogue to a completely different place. This, unfortunately, is often followed by chaos, unrest, and the complete destruction of the economy and trade. We have already seen this more than once in other countries. Such an increase in the intensity of political passions never does any good for people. Russia opposes any and all interference in the internal affairs of other countries. In Venezuela, we support efforts – including those by representatives of the region – to foster dialogue between the government and the opposition. We continue to do so now. Petyo Blyskov: What is the result you are trying to achieve? Dmitry Medvdev: The result that Russia wants to achieve is peace in Venezuela. It can be achieved only through a respectful, inclusive, intra-national dialogue. And all those who care about the peaceful future of Venezuela and South America should help to bring it about. To our deep regret, the so-called irreconcilable part of the Venezuelan opposition continues to be subjected to powerful external influence. It is actually this influence that makes this part of the opposition irreconcilable. Statements come out of Washington about the possibility of military intervention. There are provocations on the borders. All this is very alarming and suggests that the policy of overthrowing any undesirable governments in the spirit of the Monroe Doctrine is once again becoming a priority for the United States. We urge all our South American friends to think seriously about this regardless of what position they take on Nicolas Maduro’s government today. Petyo Blyskov: Are any changes in relations between Moscow and Kiev possible after the presidential election in Ukraine? Dmitry Medvdev: Russia is certainly eager to improve relations with Ukraine. We are neighbours. Many Russians have relatives there, just as Ukrainians have them in Russia. We have a common history and culture. Until recently, we had mutually beneficial economic relations. But now the situation is very difficult. To change it, we both need to move toward the middle. However, Kiev behaves in such a way that it is difficult to make any predictions. The government in Kiev regularly levels made-up accusations at us. Provocations are staged, such as the incident in the Kerch Strait in November 2018. Russia is openly used as an issue to distract voters from the government’s failures in domestic policy and the economy, from civilian casualties in Donbass, and from economic ruin. It seems that, without Russia, President Poroshenko, who is running for a second term, would have had nothing to talk to his people about. If he cannot sustain dialogue with his people, he is unlikely to be able to negotiate with the leadership of a neighbouring state. Petyo Blyskov: Do you have any hope of improving relations with any of the presidential candidates in Ukraine? Dmitry Medvdev: A fierce, dirty election campaign is underway in Ukraine. Observing this, we in Russia do not yet see with whom we could talk in Ukraine. But in any case, we will respect the choice of our neighbours, the choice of Ukrainians. And we will be open to dialogue with the new leadership – if it is interested in it. However, it matters whether the victory is fair, whether the election is legitimate and not rigged. Recent events make one suspect the worst. The presidential campaign in that country has featured flagrant violations of generally accepted democratic norms, including those guiding European countries. First, at the very outset of the pre-election marathon, Kiev, under flimsy pretexts, closed polling stations in its diplomatic and consular offices in Russia. About 3 million Ukrainians who live and work in Russia have lost their ability to vote. This is a clear violation of their electoral rights. Second, the procedure for observing the voting process has been violated. Russian citizens were prohibited from participating in election monitoring, even as part of OSCE monitoring missions. This is a serious violation of Ukraine’s own international obligations. And it is exceedingly rare in practice. Obviously, the ruling regime has something to hide.